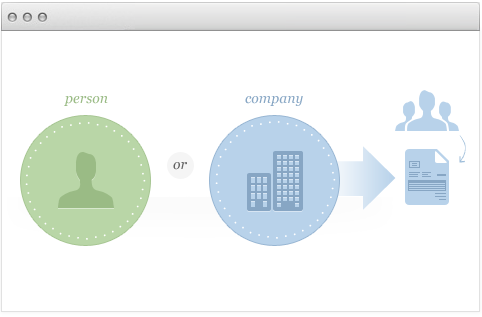 to a multi-person company - all can be managed intuitively and hustle free. 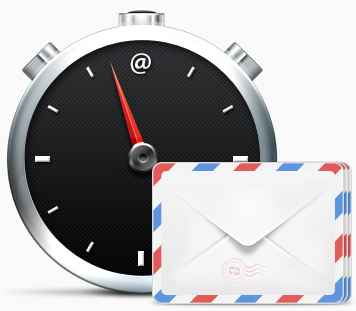 Not ready to send an invoice just yet? Schedule it for tomorrow or any other day in the future. Late Payment reminder automatically sent to client on the due date or any other? No Problem. 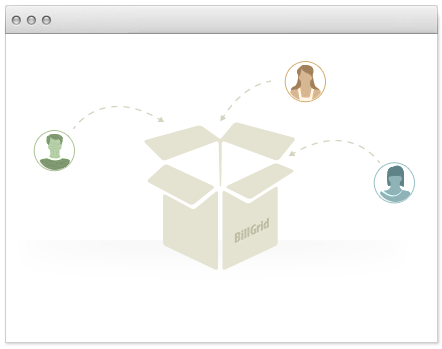 If you keep your contacts somewhere else – you don’t have to re-enter all of the information into BillGrid. Import your contacts from Google or a csv file. Competitors will envy your beautiful invoices and estimates. 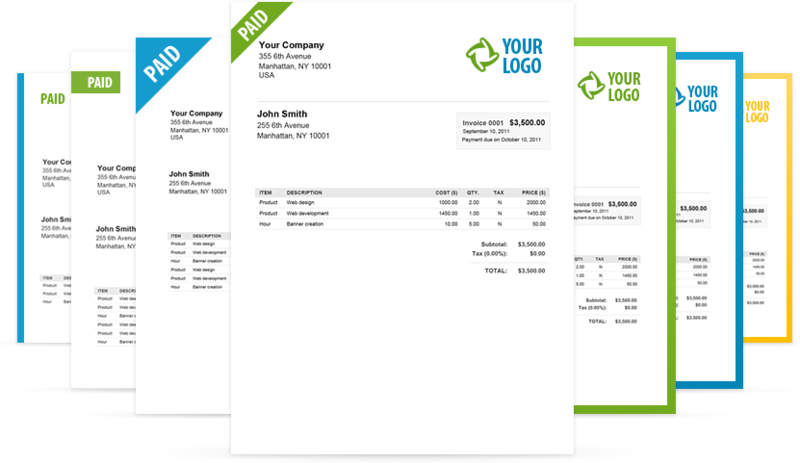 Take our word for it - better looking invoices are much more likely to be paid! Choose from various styles, passionately hand-crafted by our expert designers. 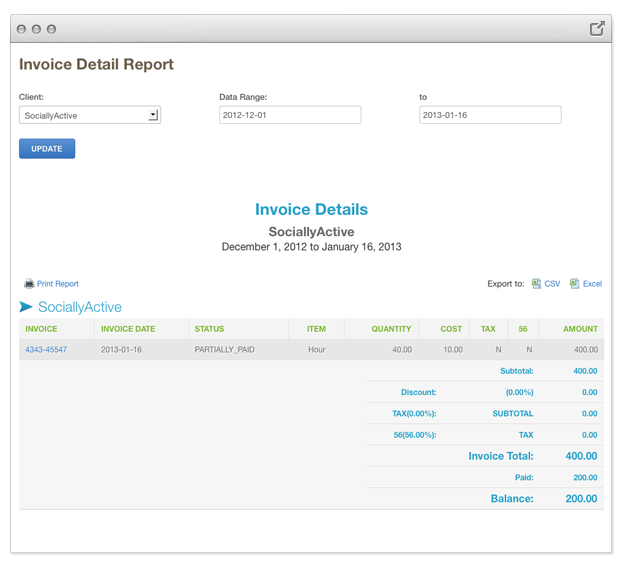 Invoices that will even make your Mom proud! If features you need - we have them here. From custom colors and styles, multiple online payment methods to file attachments and show/hide item columns.. the limit might just be your imagination. 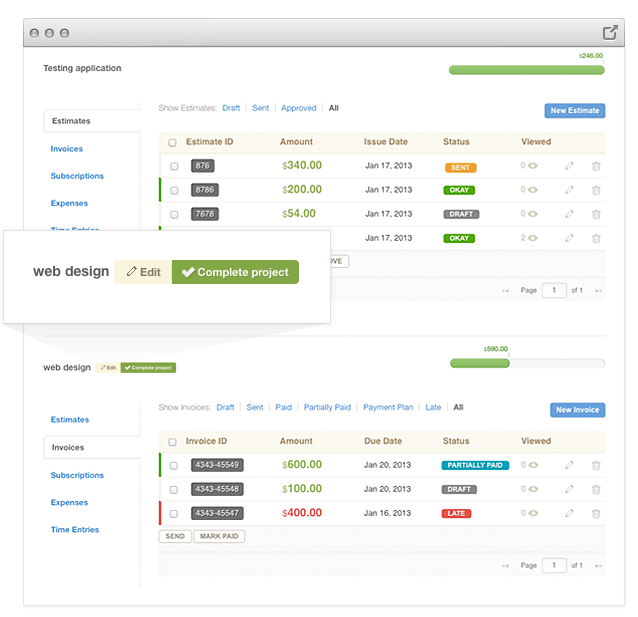 Bring your invoices to life by customizing everything! Format your line items, move them around. 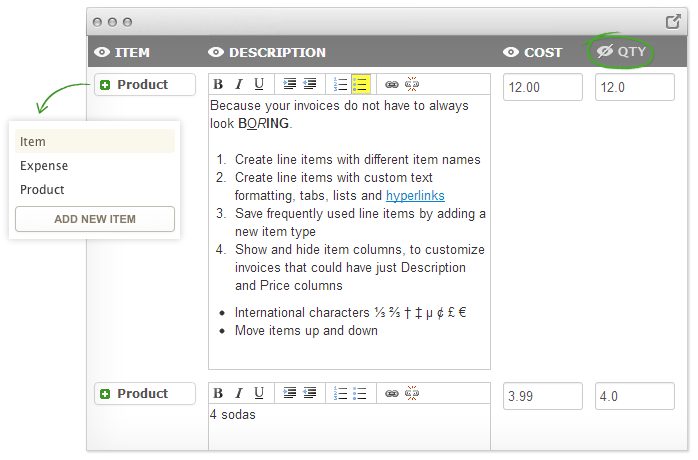 You can even hide some of the columns if that is your wish..
You can even hide some of the invoice columns! Get paid instantly with an easily integrated payment gateway like PayPal, Google Wallet, Stripe and Authorize.net. Automatic reminders will delegate the late payment reminders to BillGrid instead of you doing all the chasing. How easy is that? 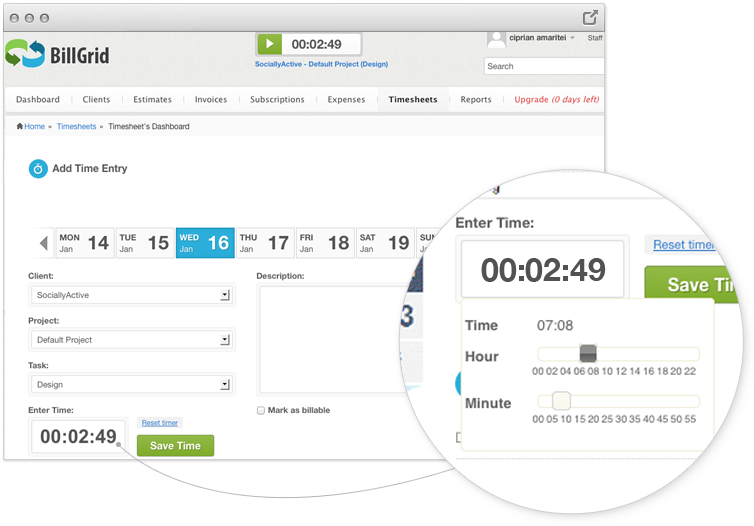 BillGrid offers intuitive time tracking whether you are a one-person company or a well staffed small business. There is no software to install and all of the time tracking and reporting is incredibly easy to use. 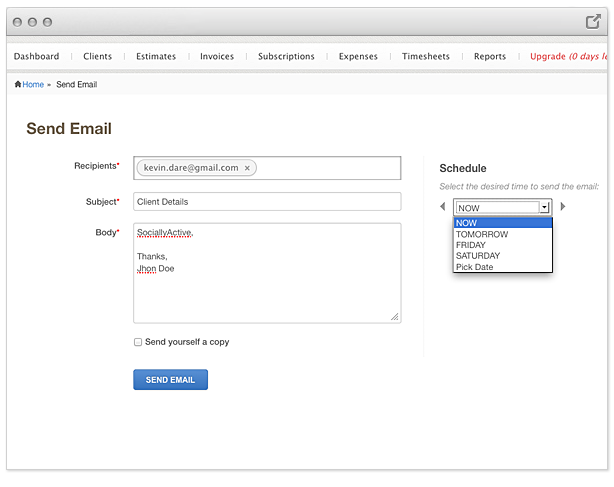 Along with an intuitive single entry method BillGrid allows a weekly entry screen to save time when entering multiple days/projects at once. 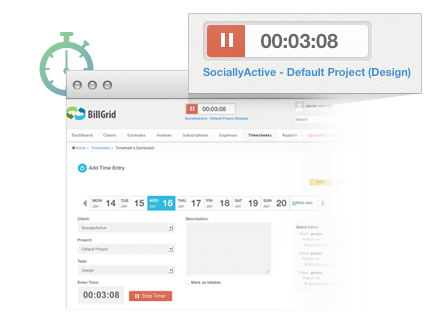 Track where your time goes with BillGrid’s powerful reporting. See all of the details with team and project breakdowns. All reports can be exported to Excel or CSV. 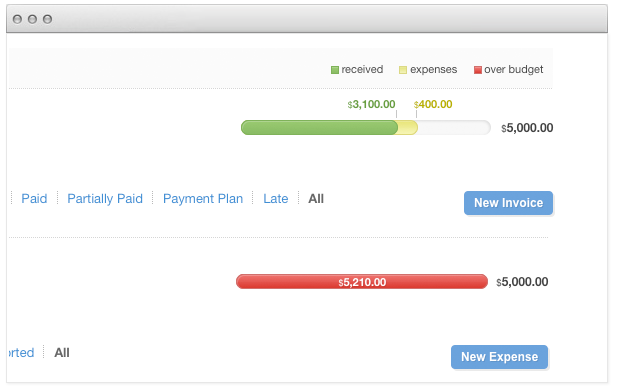 If you are billing time back to your client – BillGrid makes this easy as cake. 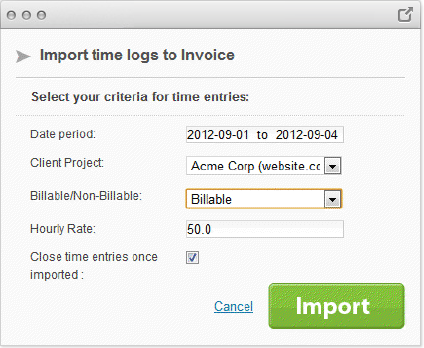 Pick your time range, project and rate and with your invoice is ready with one click! once the time tracking is enabled. Your time, estimates, invoices and expenses can be allocated separate projects within the same client. 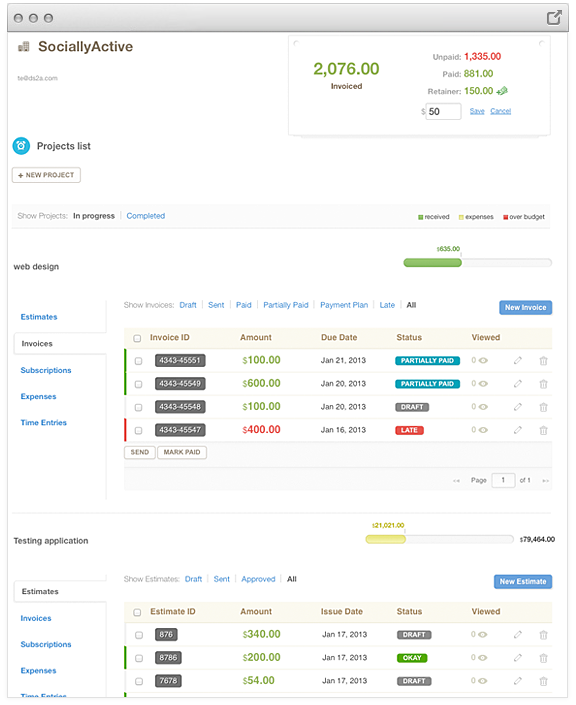 Track your projects to a target budget or just see how numbers add up together.